The University of Reading weather records, captured at the Atmospheric Observatory, are updated daily and are publicly available online. Temperatures and rain records go back to 1908, while the sunshine records start in 1956. 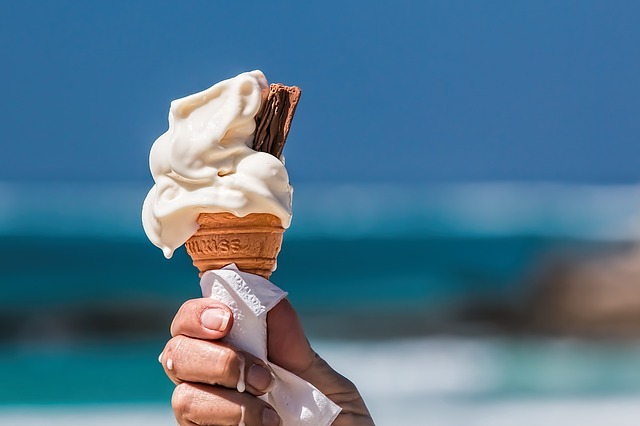 Dr Rob Thompson in the Department of Meteorology has crunched the numbers to give his perspective on the current heatwave. 32 The 32-day period with no rain recorded at the University of Reading weather station this summer was the fifth longest on our record. This run, between 18 June and 19 July inclusive, ended when 0.5mm of rain fell on Friday 20 July. The outright Reading record for days with no rain observed is 37 days, which has occurred twice, in summer 1976 and summer into autumn 1959. 6.5 The tiny amount of rain that fell last week is nowhere near enough to help our gardens and the wider countryside, though. So what if we allow a little rain in a day and keep counting? The last recorded rain before Friday was on 17 June, when just 0.2mm fell, while 0.3mm fell the day before that. There was also 0.3mm on 9 June, 1mm on 7 June and 4.6mm on 3 June. This gives a June total of 6.5mm, making it the driest month since April 2011, and the driest June since 1962. 50 We have had 50 days (and counting) without a day of 1mm or more rain, that’s third on the all time record, actually dryer than the famous 1976 summer, but beaten by autumn 1959 and spring 1997, with 57 and 51 days respectively. Current forecasts do suggest we may continue to creep towards these records. The 1976 heatwave doesn’t feature particularly in this record as, although the summer as a whole was quite dry, occasional showers hit the observatory, breaking the records of continuous dry days. 4 Our records show four months with less than 1mm of rain: April 1912 [0.8mm], June 1925 [0.5mm], September 1959 [0.8mm] and April 2007 [0.9mm]). There is a reasonable chance of 2018 equalling this record, by receiving no more rain in July – current forecasts certainly suggest this is possible, if we avoid showers. The driest July on the Reading record is 4.0mm in 1921. 27.3 It’s warm too. 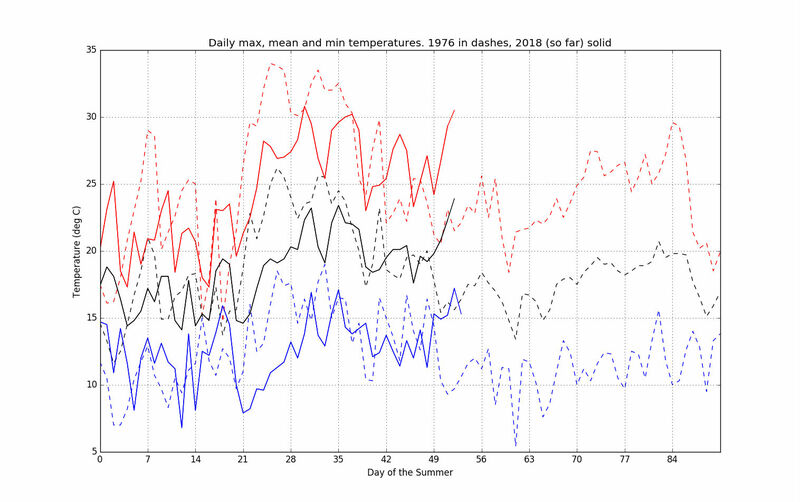 Maximum daytime temperatures are averaging 27.3°C – 4.9°C above the July average. Overnight, however, temperatures are just 1.4°C warmer than expected. If sustained, that temperature would lead to the warmest month for average daytime maximum temperature, beating the current record of 27.15°C in July 2006. 216.7 By 10am on 23 July, we’d had 216.7 hours of sunshine in July, already 10% more than an average July. The July sunshine record is 298.2 hours, set in 1959. The sunniest month on record is June 1975, when 305.6 hours of sunshine were recorded. With 9 more days of July, if it remains largely cloudless, these records could be passed. After a very average winter and wet spring, this dry summer puts us currently slightly drier than average for the year to date, 12% down on expected rain total. 1976 The summer of 1976 is almost legendary. However, often the memory is rather different to the reality. In terms of temperature, the summer of 1976 was 0.6°C warmer to this point, with an average daytime maximum of 24.6°C. This is largely because the final week of June and first of July in 1976 was really hot – 14 consecutive days crossing 30°C. We’ve not seen quite that sort of heat yet this summer, but perhaps this week will be getting onto a par. A hot week is forecast, whereas the real heat of 1976 was over by now.